As a project director at Duke CE, Nousheen delivers leadership development programs for Duke CE’s clients across the world. She works closely with the internal Duke CE team and educators. She is responsible for overall program management. Nousheen has held a range of business management and advisory roles during her career in Asia, Europe and North America. Prior to joining Duke CE, she was the Group HR partner with Vue International, where she supported the group executive team and the country management teams with the labor budget and forecasting, employee rewards, performance management and talent acquisition. Nousheen also led the executive development portfolio of the Human Capital Leadership Institute, an Asia-Pacific focused human capital think-tank based in Singapore. She and her team designed and delivered development programs for MNCs and Asian conglomerates to grow their pipeline of country and regional business leaders. 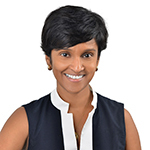 In addition, Nousheen was a Consultant with Mercer and a Practice Leader at Hewitt Associates, partnering with clients on a wide range of HR projects. She advised clients in the areas of talent development and engagement, organization and HR effectiveness, as well as employee rewards. Nousheen had the privilege of growing up in the UK, Bangladesh, The Netherlands, and Pakistan. She is delighted her professional journey enables her to work with people across diverse markets and cultures.